Rice vermicelli noodles (bun) are round rice noodles. They are white in color and soft with some elasticity. They also come in different sizes. The most commonly used one is medium size. The extra-large one is used in Bun bo Hue (Vietnamese Spicy Beef Noodle Soup). 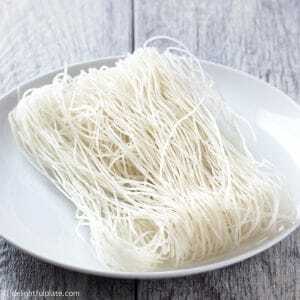 You can use vermicelli noodles in noodle soups, noodle salad and in fresh spring rolls. There are usually two ways to prepare the dried vermicelli noodles. The first way is to cook them in boiling water on the stovetop for 6-7 minutes (depending on brand). After boiling time is over, you will need to rinse them under cold water. The second way is to soak them in hot water and it takes much longer this way. Asian grocery stores carry dried bun noodles of many brands. My favorite brand is Bamboo Tree. The texture is the most similar to the bun we eat in Vietnam. 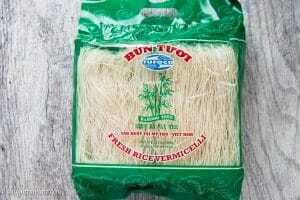 Bamboo tree (Ba Cay Tre) vermicelli noodle brand. If your Asian grocery stores don’t carry this brand, another good one is the Three Ladies brand. The Three Ladies brand can also be purchased from Amazon. Disclosure: Delightful Plate is a participant in the Amazon Services LLC Associates Program, an affiliate advertising program designed to provide a means for sites to earn advertising fees by advertising and linking to Amazon.com. We earn a small commission for qualifying purchases at no extra cost to you to support our blog. We only recommend products that we trust.